A United Launch Alliance Delta II rocket carrying the Joint Polar Satellite System-1 weather satellite stands atop Space Launch Complex 2 at Vandenberg Air Force Base in California. An attempted launch on Nov. 15, 2017 was delayed by high winds. An advanced new weather satellite will now launch into space no earlier than Thursday (Nov. 16) after unacceptably high winds prevented an early-morning liftoff from California today. 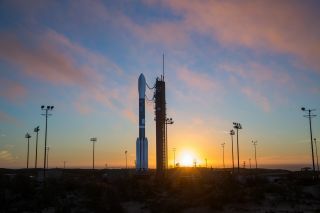 The satellite, called the Joint Polar Satellite System-1 (JPSS-1), was scheduled to launch from Vandenberg Air Force Base atop a United Launch Alliance Delta II rocket at 4:47 a.m. EST (0947 GMT), but high upper-level winds and a range safety issue delayed the liftoff, ULA officials said. The mission will now launch Thursday at the same time: 4:47 a.m. EST. At attempted launch on Tuesday (Nov. 14) was delayed by a technical issue and boats in the launch range's offshore restriction area. The JPSS-1 mission will map Earth's global weather like never before for NASA and the National Oceanic and Atmospheric Administration (NOAA). It is the first of a four-spacecraft fleet of next-generation weather satellites that will circle the Earth in a polar orbit to increase the accuracy of today's weather forecasts. JPSS-1 will circle the Earth 14 times each day in an orbit 512 miles (824 kilometers) above the planet. An artist's illustration of the JPSS-1 weather satellite in orbit. The JPSS-1 mission also marks one of the last-ever launches of a ULA Delta II rocket. The rocket will launch five small cubesats (including one that will use microwaves to track Earth's weather) into orbit along with the JPSS-1 satellite during Thursday's flight. Only one more Delta II rocket mission remains after this launch, ULA representatives have said. NASA will webcast the JPSS-1 satellite launch on Thursday, beginning at 4:15 a.m. EST (0915 GMT). You can watch the launch live here, courtesy of NASA TV.